"Le Vapologue" commits to ship all commands within 24 hours. Depending on the destination, the delivery time is estimated from 24 to 72 hours (Xpresspost service). The commands are processed from Monday to Friday (except public holiday). The commands are sent within 24 hours. For instance (in Quebec) : If you finish to order on Monday at 8pm, you command will be ready and shipped on Tuesday morning. So you will get it on Wednesday. Shipping fees are automatically calculated depending on the weight of the order and its destination. They include the fuel overload tax (+7.5 %). 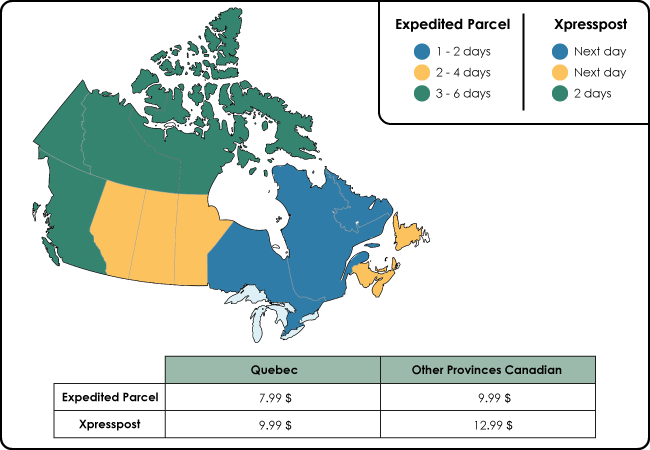 During the delivery from PostCanada, if you are away, you will get a passage notice showing the closest post office from your place where to get your package. Weight limit of 3 lb.